Zumobi – Stop Surfing, Start Zooming! 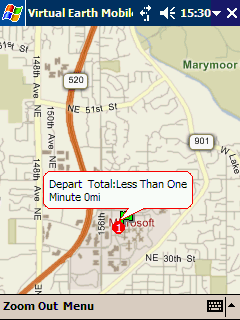 Zumobi, the mobile startup spun off from Microsoft Research, has launched its first beta. The Zumobi lets you access, enjoy, and share web-based content on your mobile phone in an innovative, new way. The Zumobi software presents a unique way to access content, with a grid of sixteen tiles that you can zoom in and out of, and the tiles acting as widgets that display web-based content. Either you navigate through a list of web sites pre-loaded on your phone, navigate through static bookmarks, or maybe even attempt to type in a long URL with your thumbs. Ugh. Now that youâ€™ve chosen your content, wait while it loads. And wait. And wait. Ok, site loaded. Read a few lines and scroll down. Scroll down. Scroll down, deeper into the abyss searching for what you wanted buried somewhere in all that content. Tedious. Often frustrating. Ultimately, itâ€™s an underwhelming experience. Zumobi Tiles create a solution through which advertising and marketing communications are highly contextual and personalized. Of course, you are also welcome to download and test Zumobi on other Windows Mobile 5 or 6 phones, but we have not fully certified these phones yet and cannot guarantee an optimal experience. Additional certified phones will be added frequently, so please check our website for the most current list of devices. Posted in Beta News, Daily Life, Windows Mobile | Comments Off on Zumobi – Stop Surfing, Start Zooming! All of a sudden, when I try to send out SMS/Text messages using my Windows Mobile 5.0 smartphone, itÂ gives me the error message “Your Text Message Cannot Be Sent”. 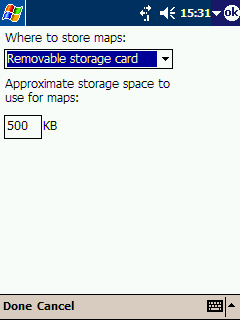 Ensure that the phone has enough space <– I found out that my Flash Memory has 0.00Mb left, and on deleting files from the flash memory, sending of SMS works again. It’s actually been there for a while – MSBLOG reported on it back in mid-SeptemberÂ but it’s now in public beta for all you techys and newbies to try out. Here’s a few compiled screenshots of it – click to enlarge. This does seem to be a non-localised issue, affecting a good proportion of the world who uses Messenger. This should be resolved in the next few hours give or take. 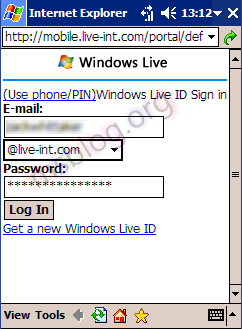 The same issue happened a few days ago but wasn’t reported on the Windows Live Support site because it was resolved within the hour. The Slam team is pleased to annouce the first release of Slam: your Windows Mobile social software client and service. Slam allows users to make and manage social groups right from their phone for group-based messaging and photo sharing. You can also use Slam through the SMS and/or web interfaces. See screenshots and learn more about Slam on the about Slam webpage, and get started your self by downloading the installer or having a link sent to your phone. 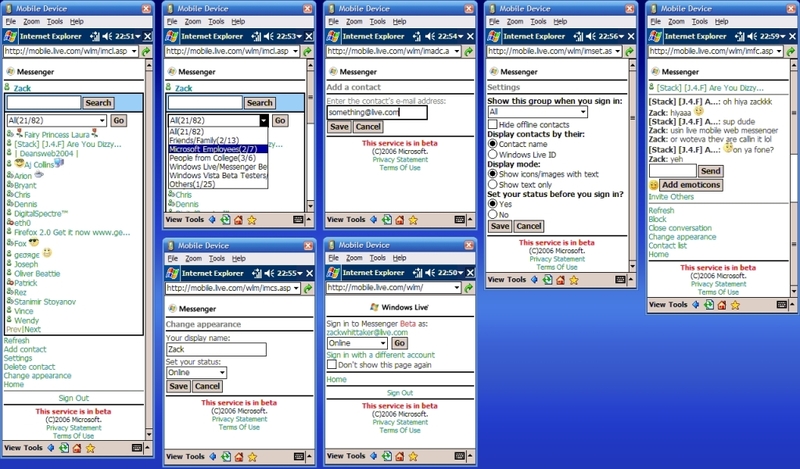 Posted in Beta News, MS News, Windows Mobile | Comments Off on Slam 1.0 Release! Windows Media Player 10 Mobile – erm, what? That to me, says that Windows Mobile 2003 SE can have Windows Media Player 10Â Mobile on it… but where the hell is it? I’ve never seen a download and/or a Windows Mobile 2003 SE device with Windows Media Player 10 Mobile on it… and I want it!! Any ideas anyone? Windows Mobile Program Manager Mel Sampat tells us that Windows Mobile Device Center (Beta 3) isÂ finally hereÂ for Pubic. The Microsoft Windows Mobile Device Center Beta enables you to set up new partnerships, synchronize content and manage music, pictures and video with any Windows Mobile 2003 or Windows Mobile 5.0 powered device. 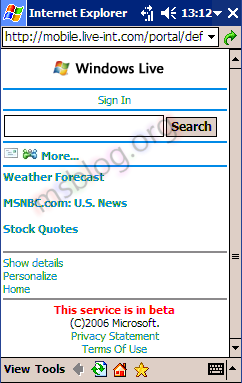 The Windows Mobile Device Center Beta is only supported on Windows Vista RC1. Streamlined setup – A simplified new partnership wizard and improved partnership management. Robust synchronization – Synchronization of business-critical data such as e-mail, calendars, contacts, tasks, favorites, and files. Photo management – Picture management helps you detect new photos on your Windows Mobile powered device, tag and import them to the Windows Vista Photo Gallery. Media synchronization â€“ Use Microsoft Windows Media Player to synchronize and shuffle music files on your device. File browsing – A new device browsing experience enables you more quickly browse files and folders and open documents on your device directly from your PC. 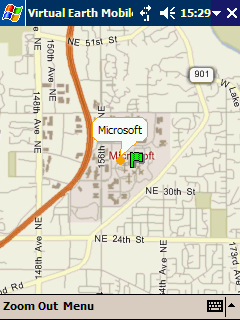 Head over to the Windows Mobile Device Center webpage at Microsoft.com to download! Mobile Live.com is here, but not quite ready yet.Â However it’s still fun to play with in the meantime. You’ll be able to see the content which you’ve personalised from viewing Live.com on your desktop computer, you’ll be able to see your Live Mail, your Live Space as well as other gadgets that you’ve added such as RSS feeds. 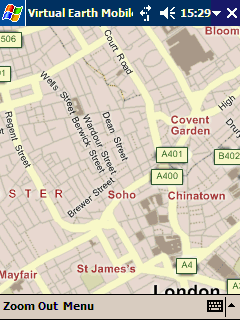 Live Web Search will be embdedded but also let you search Live Local for local businesses and stuff. At the moment, the only way to access it is via http://mobile.live.com and it has to be typed that way otherwise it’ll take you straight to Live Ideas. You can see it on a desktop computer, as well as your mobile device. 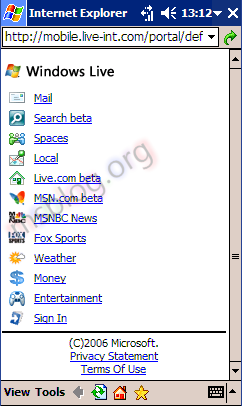 Soon it’ll have the hotspot locator in-built (which is pretty stupid seeing as you’ll need a hotspot/Internet access to view it), but you’ll also be able to see all the other things that you previously had access to with the MSN Portal such as news, money, weather and entertainment. That’s right, there’s even going to be a Mobile Web Messenger. 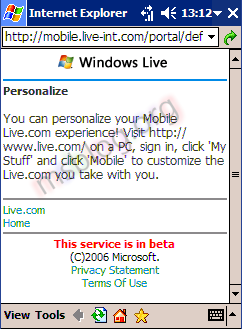 As some of you know, Windows Live Messenger 8.1 will be in beta next week, Windows Live for Windows Mobile 5.0 devices is in beta and lets you access Messenger on your phone as an application… now they’re extending it that little bit more so that anyone with a mobile device can access Messenger from anywhere. The images aren’t set yet, and the functionality is a bit crap, but it’s basically Messenger but on your mobile web browser – it even signs you out of Messenger when logged on to it from a desktop computer. You can interact with your contacts, see who’s on and who’s not and eventually you’ll be able to see their status in the form of an image. There’s a new logo,Â and thats about it. 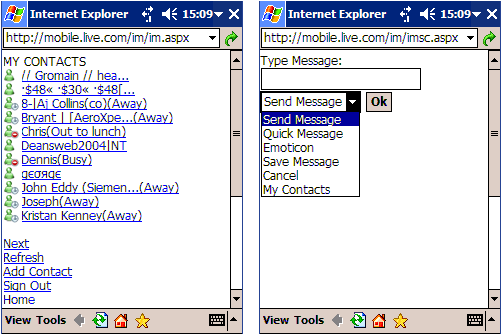 That’s pretty much the only change within the entire interface from a few days ago when it was still MSN Spaces. Nevertheless, it’s still cool and I like some of the changes they’ve done… well I like the new logo anyway, seeing as that’s all that’s changed. 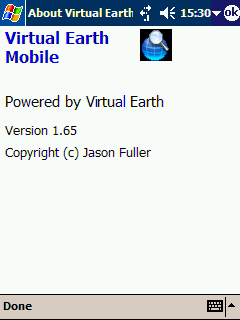 Anyway, the Windows Mobile lot have released over the last couple of days the latest Virtual Earth Mobile client which you can do loads of cool stuff, very much like what you can with Windows Live Local. 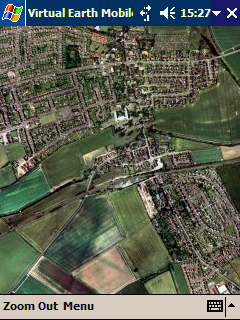 You can set and make driving directions, you can view aerial and road maps, you can even locate yourself using GPS (if you have one attached, and it’s down to the metre on the map) or Wi-Fi (which isn’t accurate generally and will usually pick up your data center or ISP)… it’s great, it really is. Here’s some screenies for you to enjoy 🙂 Click to expand.